A 501(c)(3) non-profit foundation that supports the State of Hawaiʻi's ongoing wildlife management and habitat restoration program that enhances biological diversity, ecosystem health, and cultural resources. “I’ve got the tape ready when you are Matt,” said Keelan. She bucked and roared. “She’s just having a bit of a fit, she’s alright,” he said. I peered over my shoulder to see Matt gently lift the weaned seal pup up so Keelan could slip the yellow plastic measuring tape under her bulbous body. Working together they quickly slid the tape down behind her fore flippers and wrapped the tape around her body to get a clear measurement of her girth. It was all over in a flash. I looked up to see the Kure NMFS (National Marine Fisheries Service) Monk Seal team lead, Keelan, heading swiftly back up the beach, away from our current position a few feet from the water line. I returned my gaze back to my hands. They were wrapped around a pair of silvery, brown hind flippers that now had a set of purple flipper tags in each, reading K10 and K11. I never heard the next words, but I imagine they were something along the lines of “Morgan, you can clear too”. All I felt was a hand tap me and I knew it was time to release my grip and follow Keelan up the beach. The last five minutes of my life was blissfully amazing and incredibly intimidating at the same time. I had just finished assisting in the tagging of a female Hawaiian Monk seal. The Hawaiian monk seal is one of the most endangered seals on earth and the only native seal to Hawaii. Of the genus, Neomonachus, it is the only living species. The other, the Caribbean, was last recorded in 1952 and has thus been pronounced extinct. Like its Hawaiian cousin, the Mediterranean monk seal, of the genus, Monachus, is also a species of critical concern. An estimated total population of about only 1,400 individuals has placed the Hawaiian monk seal on the endangered species list. Distributed largely across the Northwestern Hawaiian Islands (NWHI) with about 300 individuals in the Main Hawaiian Islands (MHI), the Hawaiian monk seal depends largely on the health of the surrounding environment, both marine, coastal, and terrestrial for its survival. In 2016, under Presidential Proclamation, Papahānumokuākea Marine National Monument was expanded making it the largest conservation area in United States history. The area includes the whole of the Northwestern Hawaiian Island chain and its surrounding reefs. Recognized for its cultural and environmental significance, the monument covers 582,578 sq miles with over eight major atolls and emergent reefs. This is roughly the same distance from Dallas, Texas to Las Vegas, Nevada. Impacts to these areas have a direct consequence of the survival of the monk seals. 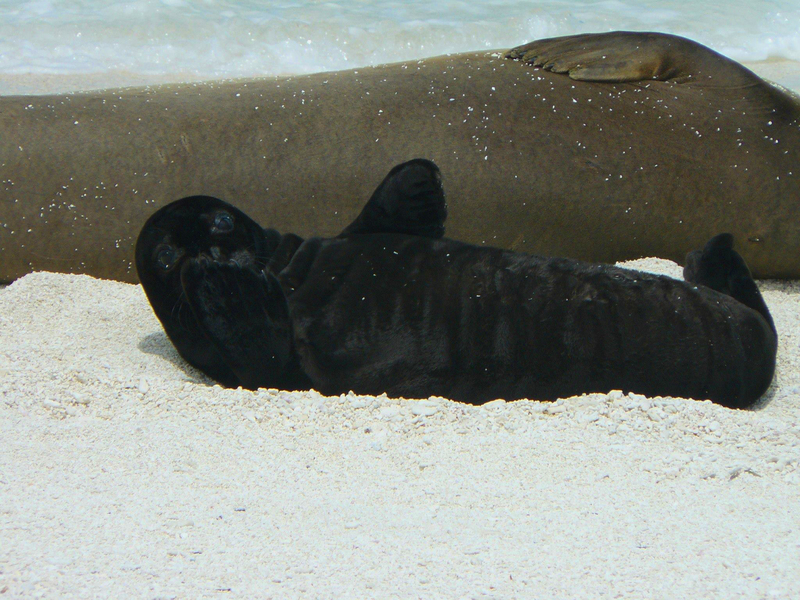 NMFS deploys summer field crews in the NWHI’s to oversee and manage the health and survival of the Hawaiian monk seals. Working in conjunction with the DLNR (Department of Land and Natural Resources) field crew on Kure Atoll, the NMFS crew is able to monitor, tag and assess the health of the local population, and intervene, when necessary, to increase survival by disentangling seals from marine debris and other actions. Setting out daily, Keelan scours the beaches and shorelines that surround all of Green Island, here on Kure Atoll, for the local seal population. He searches along the vegetation line where the seals are often found nestled in the naupaka or resting in the shade under a Heliotrope tree. Scanning across the beach he looks for mom and pup pairs or juveniles playing in the surf. Occasionally, an adult male slowly swims by and checks out the others basking on the beaches. Using his binoculars and camera, Keelan observes the seals from a distance and is able to collect various types of natural history information. He’s looking for key characteristics each seal has to help him identify individuals. Natural bleach marks, light areas on the fur akin to birthmarks; scars, from other seals or shark bites; and flipper tags serve as positive identifiers. Flipper tags are applied to the seals’ hind flippers once they are weaned from their mothers, though sometimes they are broken off and must be replaced on older seals. The tags come in a variety of colors, linking them to the atoll or island where the seal was tagged. Like a social security number, the tags are embossed with an alphanumeric code, each one unique to the individual. All of these things help NMFS track the seals as they move from atoll to atoll and island to island. Stretching all the way back to the early 80’s the program has collected data on the majority of the seals in the entirety of the Hawaiian archipelago. This data helps to paint a picture of the population status from year to year. Thus, tagging the seals has allowed for more accurate population assessments. Waiting for the perfect time to tag the seal, Keelan tracks their nursing progress and waits for the mother to wean her pup. Once the pup is weaned Keelan has a clear window for tagging. This, however, is not a one-man job. Though the seals are young, they are very strong and energetic. As such the tagging process requires the help of additional hands. Rotating through, the DLNR team takes turns sending out two people to help Keelan in the tagging. Once the call is made over the radio the team quickly assembles and heads out to Keelan’s location. We hui on the beach and he briefed us on the game plan. Once we are ready, we pick up our tagging equipment and head towards the seal. The DLNR members hold the animal in place as the NMFS member completes the tagging and takes measurements. It is all over in a matter of minutes. Afterward, we gather together at the top of the beach to discuss the tagging and observe the seal. Often, the seal rolls over and goes back to snoozing in the warm summer sun as if the past few minutes had never transpired. Now that it is tagged, the seal will have a permanent ID in the database and will be able to be tracked for years to come. The ability to track these animals is imperative to their health and the success of their population. After many decades of decline, the Hawaiian Monk Seal population has recently shown a slow increase across the Hawaiian chain, mainly fueled by population increases in the Northwestern’s. Still, the population is well below historic levels. Even with all the work the National Marine Fisheries Service does to protect these animals and ensure their health, the Hawaiian monk seals still face a multitude of threats. Years of human impact have made detrimental effects on these fragile ecosystems. Ocean productivity has varied, and when productivity is lower this has primarily impacted the younger, more vulnerable seals, which may become malnourished and may die. Competition with large carnivorous fish in the NWHI have made it harder for young seals to catch their prey. Though there is more shoreline in the Main Hawaiian Islands compared to the Northwest Hawaiian Islands, habitat loss is still a concern. And as sea levels continue to rise there will be a major decrease in proper haul-out habitat across the low-lying Hawaiian islands in the northwest. Seals come ashore to rest, molt, and raise their pups. Thus, loss of this important habitat could significantly impact the population. As such, ephemeral islands, such as those located at Pearl and Hermes Atoll and French Frigate Shoals are not stable enough to support large populations. These transient islands are often flooded or completely washed out for a matter of weeks, leaving the seals with a lack of haul-out space. What little beach is left becomes too crowded and the seals, typically mom and pup pairs, are forced to travel in search of usable space. Entanglement in marine debris is another constant threat, that if undetected can be fatal. The charisma and determination of the Hawaiian monk seal are their most endearing qualities of all. Their species has faced many obstacles, yet they continue to endure. Without the collaborative efforts of multiple agencies, the future of the monk seals would be rather bleak. Though they are not out of the dark yet, the monk seals are holding on and there are positive signs. With each year more vital than the last it is crucial that their work continues. Having first-hand experience of the plight of the monk seals makes a strong impression, one that might not be easily grasped to those outside the realm of the Northwestern’s. We can only hope that by shedding a light on the state of the monk seals, more people will choose to lead eco-conscious lifestyles and fight for the survival of these and other irreplaceable animals. Until greater changes are made, people like Keelan will continue to be the shepherds of the “llio-holo-i-ka-uaua” or “the dog that runs in rough seas”. What is your favorite RA or NMFS Sector and why? Morgan: The DLNR sectors because of the huge challenge they provide with the tall naupaka, variety of non-natives and the large space. And of course, because of the Christmas Shearwater chicks! Kelleigh: Pu’u Moli because I like the challenge of the hot spot and getting to see the Dino-ducks. Brett: Southwest Dunes because of the views of the island, it’s different from what we normally see, and because it is full of natives. Keelan: NMFS Sector 2 because it gives me the best cover to observe the seals. Allison: RA 08 because after the removal of Cassytha it has provided major nesting habitat for a large diversity of birds. Matt: West Central Plain Edge because you travel a long distance, so it feels very productive. Also, during my first season, we hand-pulled all the Verbesina and it felt like we hardly covered any area whereas now we can treat the entire RA in one clean sweep. Vladimir: West Land Fill/ West Turn Around because it is action packed with lots of non-natives and has the best views and ocean breeze. Leah: Any RA with a lot of naupakas because it supports a large diversity of birds. Naomi: Nav Tree and Radar Hill because I am super proud of the work we had completed in those areas over the years and even though the Nav tree is a non-native Ironwood I like the ocean breeze through the needles. Copyright © 2019 Kure Atoll Conservancy. All rights reserved.